The Vedanta system associated with Sankara is like a well-structured and thoughtfully planned building. Its structure and beauty, as in the case of a building, are dependent on the solid foundations on which the system rests. While its ramifications make it a total system (purna), the principle of harmony (samanvaya) which connects and unifies its different dimensions contributes to its beauty. Even though Sankara is neither the founder nor the first exponent of the system as there were illustrious predecessors like Gaudapada, his own teacher’s teacher, and also great exponents like Yajnavalkya before him, still his name is invariably associated, in some way or other, with the system of Advaita as if he were the founder or the first exponent. The simple and the only reason for this is his brilliant contribution to both the structure and the beauty of the system. The system speaks for him, and he stands before it like a colossus. As in the case of other systems, the Vedanta too has been developed by a group of three works (trilogy) - the Sutra work, the Bhasya work, and the Vartika or Tika work. The basic Sutra work composed by Badarayana provides the foundation for the system. Sankara wrote his Bhasya on the Brahma-sutra of Badarayana. 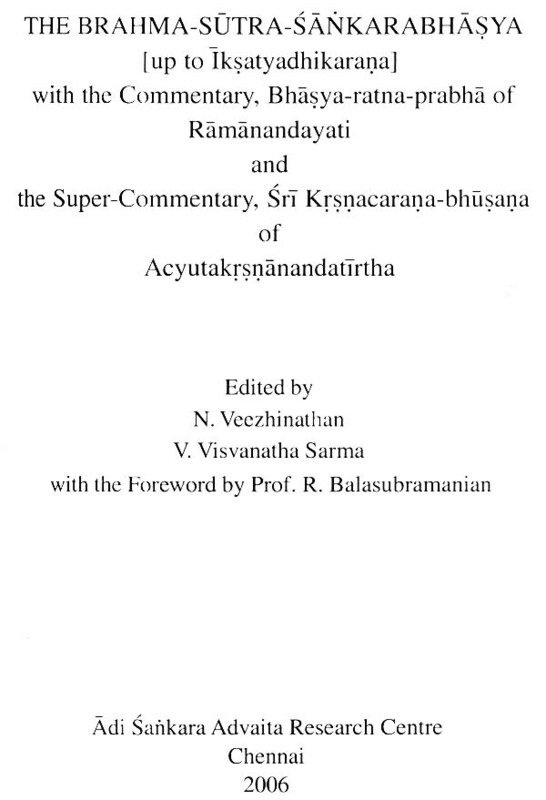 Though we do not have a Vartika work on Sankara’s Brahma-sutra-bhasya, as we have Suresvara’s Vartikas on Sankara’s Bhasyas on the Taittiriya Upanisad and the Brhadaranyaka Upanisad, we have Tikas or sub-commentaries which fairly make up the absence of a Vartika. While the Bhasya work may be characterized as the first order commentary, the Vartika or the Tika work may be viewed as the second order commentary. Such a distinction is for the purpose of highlighting the importance of the Bhasya work. The concept of the oneness which finds a clear expression in the Rg-vedic hymn is elaborated in the Upanisads, which are quite a few. There was the need to bring together the ideas scattered in the Upanisads for the purpose of easy comprehension and effective retention. Badarayana arranged the teachings of the U panisads logically, gave them the shape of a system, and conveyed the basic ideas through aphorisms (sutras). If the Upanisads are viewed as flowers, then for stringing them we have the thread (sutra) provided by Badarayana. Though the Sutras are supposed to be not only concise, but also unambiguous, conveying all aspects of any topic without repetition and in a faultless way, still because of the brevity and terseness of the Sutras, it will be difficult to comprehend the full significance of them without the help of a commentary. 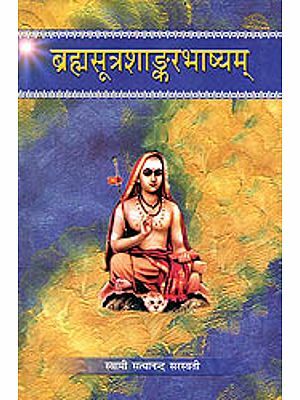 Sankara’s commentary on the Brahma-sutra is of great help to us in understanding the entire teaching of the Upanisads through the Brahma-sutra. 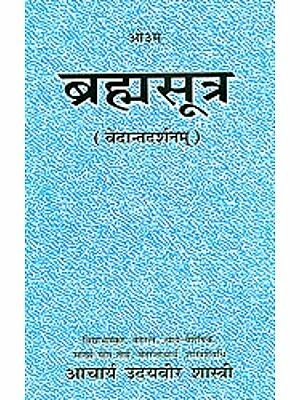 A commentary (Bhasya) is expected to bring out the meaning of the cryptic or aphoristic declarations of the original and also the meanings of the words contained therein. Sankara’s Bhasya, according to Padmapada, reveals three noteworthy features. First of all, it is lucid as well as profound (prasanna-gambhira). Secondly, the textual interpretation and analysis of the ideas enshrined in them are made intelligible through reasoning. Safeguarding the primacy of scripture, particularly with regard to the knowledge of the transempirical Brahman/ Atman, Sankara makes full use of reasoning in establishing his position. Sankara’s Bhasya serves as a model of exegetical art, philosophical reasoning, and argumentative skill. Since Padmapada refers to him as anumardhavigraha, we may reasonably conclude on the basis of the significant expression used by him that, while one part of his divine being is devoted to scripture, the other half takes care of reasoning, not in the narrow sense of tarka, but in the most comprehensive sense of philosophical reasoning. Thirdly, Sankara attained celebrity by his commentary, and also as the bestower of happiness (bhasya-vittaka-guru). It is necessary to point out in this connection that Sankara scrupulously follows a particular pattern in his commentaries. He brings out the purport of the text, introduces, wherever necessary, the different sections indicating the connections, or introduces the opponent’s view (purva-paksa), with a short explanation, and then gives the refutation of the opponent’s view with his final conclusive view (siddhanta). Also, he makes it a point to explain the grammatical peculiarities and Vedic usages, and would discuss at great length in some places the important issues connected with the main problem. He has always respected the usage of words, the syntax and semantics of sentences, and the means of proof (pada-vakya-pramana). This also means that Sankara, as a traditionalist, feels the necessity to make use of the science of grammar (Vyakarana), the Vedic exegetics (Mimamsa principles), and the methods of reasoning (Nyaya system), while doing philosophy. v) those that set forth the means to Self-realization here and now. Many of the sutras are devoted to a discussion on these texts, while a few of them are concerned with an evaluation of the viewpoints of other schools on the basis of reasoning alone without any reference to the authority of the Upanisads. 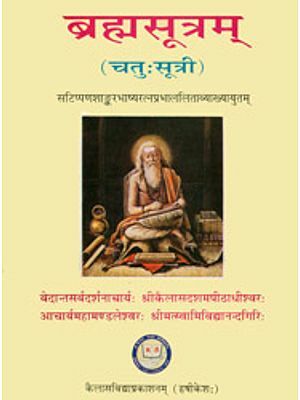 The first adhyaya of the Brahma-sutra is entitled samanvayadhyaya. Herein, select Upanisadic texts which convey the Self as free from all attributes (nirvisesa) and also as endowed with attributes (savisesa) are taken up for discussion. These texts are twofold: some of them are perfectly precise in their reference to the Self in its dual aspect of nirvisesa and savisesa leaving no doubt as to what is excluded, and are, therefore, called spasta-brahma-linga-sruti. There are other texts which no doubt convey the Self in its twofold aspect, but the words or phrases used therein may be taken as signifying the jiva or pradhana. These texts are known as aspasta-brahma- linga-sruti. The first pada of the first adhyaya deals with spasta-brahma-linga-sruti, while the second and third pada, with aspasta-brahma-linga-sruti. The fourth pada largely centres around the discussion on the significance of the terms “aja’, “avyakta”, etc. found in the Upanisads. It is ascertained herein that these words signify the principle of maya or avidya and not the pradhana of the Sankhya school. This section concludes by presenting the view that the Upanisads clearly point to the Self as the material and the efficient cause of the world.